Whether you’re a west-sider or east-towner, homeowner or lifelong renter, your neighborhood is probably changing. Here's what some of that change will look like in the days ahead. From luxury condos nestled near towering new event venues to restored residential units sitting above a plethora of recently debuted ground floor retail, you can’t swing your arms in downtown Grand Rapids these days without hitting somebody’s mixed-use development project. With apartment occupancy levels hovering above 98 percent and rental rates rising by over 5 percent — both for the second consecutive year in a row — the fact of the matter is that the downtown landscape is changing in a very literal sense, and is increasingly bringing in more retail and residential interest to the downtown areas. So, whether you’re a west-sider or east-towner, humble homeowner or lifelong renter, your neighborhood is probably changing — for better or worse. With such a huge roster of projects in various stages of development throughout the city, it’s hard to keep track of what’s new, improved or otherwise. We’ve rounded up 10 projects we think are pretty illustrative of the sweeping change coming to Grand Rapids, and we’ll be keeping a close eye on them in the year to come. Approved by the Grand Rapids City Commission last year, the $439,000 quarter-mile trail extension along the east side of the Grand River will build a 12-foot wide concrete path from where the existing trail ends at Canal Street Park northward to Leonard Street NW. The trail will include lighting, ornamental fencing, benches, and river overlooks — all built on an old railway that runs between the city buildings and the river. Funded by a combination of $182,000 in federal grant monies, $131,000 of the city’s capital improvement fund, $75,000 from the Monroe North TIFA, and $50,000 from the West Michigan Trails & Greenways Coalition, the trail extension represents the potential in a much larger Grand River restoration effort aiming to utilize the natural resource that put our city on the map in the first place. Not only will the 2,400-seat entertainment space bring in an estimated 120 additional ticketed events to Grand Rapids each year, but the two-story expansion of the B.O.B. includes a 5,000-square-foot outdoor beer garden between Monroe and Ottawa avenues north of Fulton Street and an adjacent 14-story residential tower called The Venue Towers — all smack dab in the middle of Grand Rapids’ city center. The project broke ground in October 2015, but isn’t scheduled for completion until early 2018. Although parts of the S. Division Corridor have already seen some pretty incredible transformations over the past year — especially the stretch of blocks along S. Division referred to as Avenue for the Arts, which welcomed 10 new businesses into recently renovated retail spaces and Dwelling Place sponsored live-work digs this fall alone — the Grand Rapids City Planning Department will also launch a pretty extensive planning process for the S. Division Corridor. Planning Department Director Suzanne Schulz says the community engagement process will include conversations about how best to create business opportunities, jobs, and housing along the corridor, which is also home to Michigan’s first Bus Rapid Transit line. The city itself hasn’t created any direct lines to get involved with S. Division Corridor planning just yet, but there’s a lot of grassroots community revitalization efforts happening along S. Division’s Avenue for the Arts, thanks to help from the non-profit Dwelling Place, and there are all kinds of opportunities to get involved in the conversation. A long time coming redevelopment effort by local developers at Orion Construction Co., the $45 million Arena Place repurposes an old parking lot at 158 Weston St. SW for its 11-story mixed-use project. 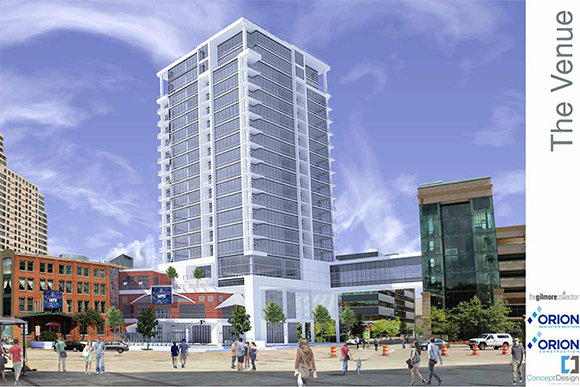 The long-awaited Arena will put 100 market-rate apartments, 280 parking spaces, and 17,000-square-feet of ground floor retail and restaurant space across from the Van Andel Arena, with some additional outdoor seating. The project was financed by a mix of of private capital, a bank loan, DDA tax increment financing capture, and support from the Michigan Economic Development Corp.’s Community Revitalization Program. Residential units will begin leasing this spring, followed with a summer move-in by Arena Place commercial tenants Miller Johnson, Meritage Hospitality, and DO MORE GOOD. Though Third Coast Development’s Diamond Place project and Brookstone Capital’s upcoming 20 E. Fulton aren’t geographically related, the two projects introduce the mixed-income housing concept to the city by way of two highly visible properties in well-trafficked Grand Rapids neighborhoods. Still in the planning stage, Diamond Place proposes 150 new affordable apartments and four retail buildings along a block of Michigan Street at addresses 1037 and 1001 Michigan St. NE, with a majority of its one- and two-bedroom units made affordable to persons at or below 80 percent of the area’s median income. Currently under construction, Brookstone Capital’s 20 E. Fulton development lies a little closer to the heart of downtown. At $37 million, the project puts a 14-story mixed-use building at Fulton Street and Sheldon Avenue that will contain about 108 one- and two-bedroom apartments equally divided between workforce housing and market-rate units, about 9,000 square feet of ground floor retail, and a five-story parking deck with 180 spaces. When completed, 20 E. Fulton has been projected to generate $596,000 in new property tax revenue each year, with more than $99,200 going to the city. The city is also expected to gain around $40,000 in new income-tax revenue annually from the building’s residents and employees. Currently under construction, 2016 will usher in the completion of two new market rate apartment projects in the Belknap Lookout neighborhood, where developers received approval from the city commission to rezone the land to a “planned redevelopment district” in the summer of 2014, demolishing much of the former residential housing to make way for the two new projects. The $8 million Clancy Lofts will bring 66 market rate units to Clancy Avenue NE, north of the Gateway @ Belknap project, a mixed-use combination of 86 new market rate units above ground floor retail and restaurant space. Both projects are scheduled for completion before the end of the year. Last year, Grand Valley State University also bought a four-block area east of the Gateway site for $18.9 million, geographically bounded by Hastings and Trowbridge streets and Clancy and College avenues on the north side of I-196. The 11 acres have been earmarked by GVSU’s Board of Trustees for the future of expansion of the adjacent adjacent Cook-DeVos Center for Health Sciences along the Medical Mile corridor. Armed to the teeth with residential development projects to house the ever-growing health industry workers on Grand Rapids’ Medical Mile, the continuation of the new Michigan State University Research Center — a six-story, $88 million biomedical research building on the seven-acres formerly home to a demolished Grand Rapids Press — is joined by CWD Real Estate’s redevelopment of the historic Rowe Hotel, which, when completed, will add 77 market-rate apartments to a long dormant stretch of the city. Construction is already underway for the massive 290-unit apartment complexes along Grand and Benson avenues NE by developers at RISE Real Estate that include a 334-car parking deck. And just this week, 616 Development began renting out one- and two-bedroom apartment units at Lofts on Michigan, a four-story, 54-unit mixed-use on the corner of Michigan Ave. NE and Eastern Ave. NE. City planners say the department will also step up its focus on improved transit as outlined by the extensive Michigan Street Corridor Improvement Plan that is designed to address congestion along Michigan Ave. as a result of increased development. Non-profit housing developers at LINC Community Revitalization, Inc. have done more than their fair share of breathing new life into Grand Rapids’ Southtown, recently completing the $13 million Southtown Square. The four-story complex brought 24 affordable, energy efficient apartments and 6,000 square feet of commercial space to the area. Southtown’s final phase introduced an additional 20 new town homes that replaced sub-standard housing in the Madison Square neighborhood. This year, LINC is expected break ground on another $15 million housing and commercial project called Eastern Village, which replaces several older homes and vacant lots along a blighted block of Eastern Avenue SE. The affordable housing project is nearly twice the size of Southtown Square, with plans including more than 70 units of housing — a mix of apartments, town homes, and row housing, as well as 12,000 square feet of commercial space. Pending approval from the city of Grand Rapids’ Planning Commission, LINC is expected to begin construction on the project this spring with an expected 2017 completion date. Rockford Development Co. construction crews began work on the 40,000-square-foot New Holland Brewing Co. brewpub, distillery and restaurant in October 2015, and the venue is expected to debut at the corner of Bridge Street and Broadway Avenue in the fall of 2016. The company said the business will house onsite distilling capabilities, with a heavy focus on gin and botanical spirits, and the 400-plus seat restaurant will include an outdoor bar and beer garden. Plus, the site will house Michigan-themed apparel company The Mitten State in its ground-floor retail space. New Holland’s Knickerbocker — Brewpub and Distillery project is joined by a growing number of small businesses moving new retail into the area, among them the recently announced urban tasting room by cider-maker People’s Cider, which joins The Mitten Brewing Company and Long Road Distillery in three consecutive storefronts along West Leonard. Announced in conjunction with two other redevelopment plans by local building owners, 616 Development’s Lofts on Plainfield will add 60 market-rate apartments at 1359 Plainfield Ave. in a budding Creston-Cheshire business district that's home to a whole host of beautiful historic buildings just begging for thoughtful renovation. Residential units will be built atop 2,600 square feet of ground floor retail space and align with the further expansion of Creston Market, which opened last year in an entirely reinvented corner store in an effort to meet underserved community needs for accessible groceries.